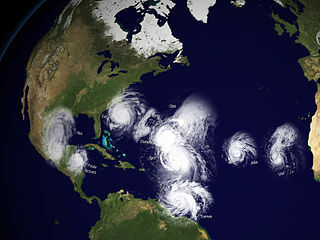 As Hurricane Isaac threatens the Gulf, I am reminded of the devastating effects of nature. There’s something feral about hurricane winds. Your animal side responds to its howl. Can you outwit nature? Subdue it? Do you really have dominion? “You have time. But please, honey, come as soon as you can. We’re getting ready for it. Bring everything you’ll need for the next several days just in case….” I said. That night after the wind knocked out the power, we listened to news on a battery operated radio. My daughters, all of them, huddled in the living room and clung to every word of the emergency broadcast…A loud crash broke the concentration. Armed with flashlights and rope, my husband and son-in-law left the house to investigate. The girls held hands and prayed. As I watched the men though the window, their flashlights illuminated blurs of their movement – the struggle to tie rope to the posts and tether themselves, their blown faces like distorted images in a fun house, the rain slamming them sideways. When they returned, the girls threw questions at them. What happened? Did you see the barn? Are the horses okay? What was that noise? “The sycamore, the one by the driveway, toppled over,” Mike reported. At this point, most of us were exhausted. We were tired of listening to the wind, the tinny radio voices, and the pelting rain. I blew out the candles and brought out blankets and pillows. We dosed. In the light of dawn, the brightest light I had ever seen, we stumbled awake and gathered outside. I heard a scream. In the blink of an eye, our yard had become a strange landscape. Toppled trees and branches obscured the view of the street, the barn, and the pond. A large oak lay across the front field. The top of an old cedar had hurled like a spear into Marie’s ragtop. She was still screaming. She loved that car. We comforted each other and checked on our neighbors. All the people on our street were without electricity too, but no one was hurt. For the next several days, I would bond with my neighbors in ways I wouldn’t have otherwise. We held grilling parties to share thawing food, passed around generators for our well pumps, and took turns with chain saws to clear the road of fallen trees. A friend fixed Marie’s car. Within a few weeks, our lives returned to normal, but we would never be the same. We learned about the power of people and the power of nature. United in humanity, we do have dominion.